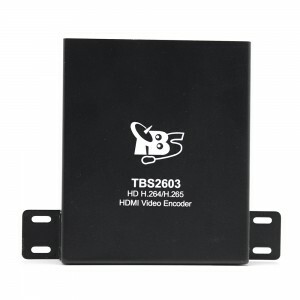 Here is an unboxing review of TBS2603 HD H.264 / H.265 HDMI video encoder. TBS603 supports 1 channel HDMI stream of H.264/H.265 encoding output and the AAC, Mp3 audio format. From any HDMI input source, it generates an H.264/H.265-encoded stream compliant with HTTP/RTSP/RTP/RTMP/UDP protocols. TBS2603 can be applied to education, health care, IPTV, conference, remote education, news interview, banking, transportation and other industries. Have Fun with TBS2630 16 Channel HD H.264/H.265 HDMI Encoder! How to have fun with this professional encoder in a new way? Just get TBS2630 16 channel professional hd video encoder and new arrival TBS2660 professional h.265 ip video decoder together! Posted on July 27, 2016 July 27, 2016 Author jennyCategories DVB Topic, HDMI Encoder1 Comment on Have Fun with TBS2630 16 Channel HD H.264/H.265 HDMI Encoder! TBS2603 professional H.265 HDMI encoder supports 1 channel HDMI stream of H.264/H.265 encoding output and the AAC, Mp3 audio format. From any HDMI input source, it generates an H.264/H.265-encoded stream compliant with HTTP/RTSP/RTP/RTMP/UDP protocols. That’s all. Thanks for your attention and support. Have a nice day! TBS6909 DVB-S2 8 Tuner PCIe Card’s Windows Driver for Multi-switch is Released to V1.0.0.1. 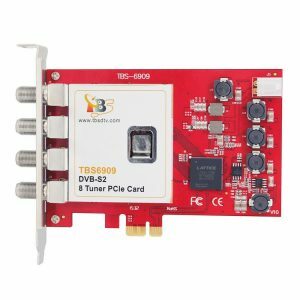 TBS6909 is a powerful DVB-S2 octa tuner card with PCI Express interface, it is capable of receiving SD/HD digital TV channels from 8 different satellite transponders simultaneously , which is considered as a professional TV tuner for industrial-level users. When you have limited PCIe slots in your server, TBS6909 enables you to receive more channels than the usual dual or quad TV tuner, thus it is highly recommended for IPTV streaming and broadcasting system. Thanks for your attention and support. Have a wonderful day! Posted on July 13, 2016 July 13, 2016 Author jennyCategories Windows Related1 Comment on TBS6909 DVB-S2 8 Tuner PCIe Card’s Windows Driver for Multi-switch is Released to V1.0.0.1. Do you wanna know how does TBS5925 work with openATV? You will find the answer in this awesome mini demo. Thanks for your watching. Any feedback will be much appreciated! TBS5925 USB DVB-S2 Professional external TV Tuner box is compatible with EUMETCast. Built with the highest industry standard and rock reliability make TBS5925 become the device that any personal enthusiasts or engineers in digital satellite TV industry dream to have. The applying of an unique DVB-S2 demodulator chipset makes it possible to receive special streams broadcasted with ACM, VCM, Multi Input Stream(MIS), 16APSK, 32APSK, which most satellite receiving devices can’t support. Thanks for your attention and support. Have a nice day!